Craspedacusta sowerbyi has been introduced to freshwater systems all over the world, but due to its unpredictable blooms, little is known about its influence in these ecosystems. C.sowerbyi is unusual for its upstream-oriented tentacles. This contrasts with the majority of jellyfish, which forage with tentacles trailing downstream. 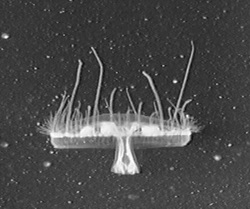 This posture places the tentacles in a region of high flow circulation induced by the movements of the jellyfish's body (the bell). Using high-speed imaging techniques, I characterized the movements of the water around C.sowerbyi and found that its tentacles are positioned in areas of quiet flow. This enables the jelly to act as a stealth predator and capture prey sensitive to water movement. I also explored how predation mode and tentacle function may vary by tentacle length as a consequence of the behavior of nearby fluid. Photo by Michael Bentley, 2011, used under Creative Commons. via Flickr. Aquarium systems let researchers bring aquatic organisms in from the field to study their behavior in more detail. Yet, unlike an aquarium tank, the natural environment features tides, waves, and currents, which introduce chaotic flows into the water column. 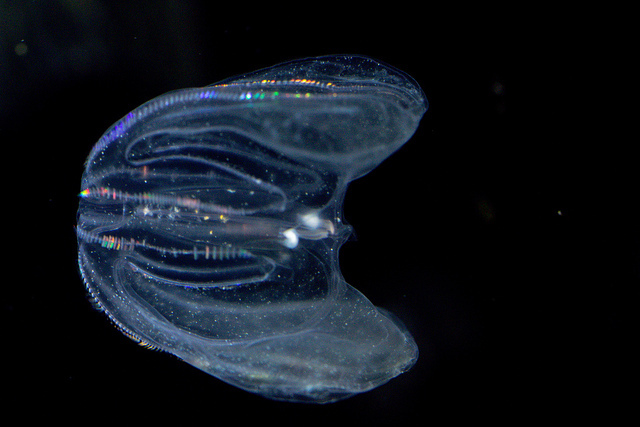 For gelatinous zooplankton like comb jellies (Mnemiopsis leidyi) at the mercy of currents, turbulent conditions could change how often food is encountered, the types of food encountered, and may lead to damage to the jelly's body. To determine how these turbulent conditions alter feeding rates and prey selection from the idealized case - calm waters in an aquarium - we introduced turbulence into laboratory aquaria, and captured and examined the gut contents of comb jellies in coastal waters during calm and windy conditions.